Beer is a major part of German culture. German beer is brewed according to the Reinheitsgebot, which only permits water, hops, and malt as ingredients and stipulated that beers not exclusively using barley-malt, such as wheat beer, must be top-fermented. In 2012, Germany ranked third in terms of per-capita beer consumption, behind the Czech Republic and Austria. The Reinheitsgebot ("purity decree"), sometimes called the "German Beer Purity Law" or the "Bavarian Purity Law" in English, was a regulation concerning the production of beer in Germany. In the original text, the only ingredients that could be used in the production of beer were water, barley, and hops, which had to be added only while the wort was boiling. After its discovery, yeast became the fourth legal ingredient. For top-fermenting beers, the use of sugar is also permitted. There is a dispute as to where the Reinheitsgebot originated. 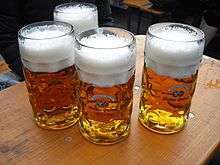 Some Bavarians point out that the law originated in the city of Ingolstadt in the duchy of Bavaria on 23 April 1516, although first put forward in 1487, concerning standards for the sale and composition of beer. Thuringians point to a document which states the ingredients of beer as water, hops, and barley only, and was written in 1434 in Weißensee (Thuringia). It was discovered in the medieval Runneburg near Erfurt in 1999. Before its official repeal in 1987, it was the oldest food-quality regulation in the world. Weizenbier and Weißbier are the standard German names for wheat beer – "Weizen" is German for "wheat", and "weiß" is German for "white". Weizenbock is the name for a strong beer or bock made with wheat. 16-17° Plato, 6.5-8% ABV. Roggenbier – a fairly dark beer made with rye, somewhat grainy flavour similar to bread, 4.5-6% ABV. Berliner Weisse – a pale, very sour, wheat beer brewed in Berlin. 9° Plato, 2.5-5% ABV. The beer is typically served with raspberry or woodruff flavoured syrup. Leipziger Gose – an amber, mildly sour, wheat beer with an addition of salt, brewed around Leipzig. 10-12° Plato, 4-5% ABV. Hefeweizen – an unfiltered wheat beer. "Hefe" is German for yeast. 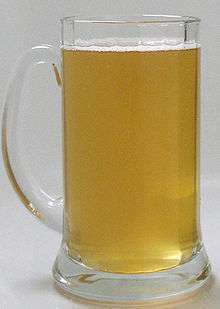 Kristallweizen – a filtered wheat beer. Characterized by a clear appearance as opposed to the cloudy look of a typical Hefeweizen. Kottbusser – an heirloom style originating in the city of Cottbus, typically containing oats, honey and molasses in addition to wheat and barley malts. Altbier — a top-fermented, lagered beer. It is brewed only in Düsseldorf and in the Lower Rhine region. Its origins lie in Westphalia, and there are still a few Altbier breweries in this region. Tastes range from mildly bitter and hoppy to exceptionally bitter. About ten breweries in the Düsseldorf region brew Altbier at 5%-6.5% ABV. Export — a pale lager brewed around Dortmund that is fuller, maltier and less hoppy than Pilsner. 12-12.5° Plato, 5-5.5% ABV. Germany's most popular style in the 1950s and 1960s, it is now becoming increasingly rare. Kölsch — pale, light-bodied, top-fermented, beer which, when brewed in Germany, can only legally be brewed in the Cologne region. 11-12° Plato, 4.5-5% ABV. Maibock — a pale, strong lager brewed in the Spring. 16-17° Plato, 6.5-7% ABV. Märzen at Oktoberfest, served in the traditional 1-litre Maß. Märzen — medium body, malty lagers that come in pale, amber and dark varieties. 13-14° Plato, 5.2-6% ABV. The type of beer traditionally served at the Munich Oktoberfest. Pilsener — a pale lager with a light body and a more prominent hop character. 11-12° Plato, 4.5-5% ABV. By far the most popular style, with around two thirds of the market. Spezial — a pale, full, bitter-sweet and delicately hopped lager. 13-13.5° Plato, 5.5-5.7% ABV. Bock — a heavy-bodied, bitter-sweet lager darkened by high-coloured malts. 16-17° Plato, 6.5-7% ABV. Doppelbock — a very strong, very full-bodied lager darkened by high-coloured malts. 18-28° Plato, 8-12% ABV. Dunkel — a dark lager which comes in two main varieties: the sweetish, malty Munich style and the drier, hoppy Franconian style. Schwarzbier — a bottom-fermented, dark lager beer with a full, roasty, chocolatey flavor. 11-12° Plato, 4.5-5% ABV. Kellerbiers are unfiltered lagers which are conditioned in a similar manner to cask ales. Strength and colour will vary, though in the Franconia region where these cask conditioned lagers are still popular, the strength will tend to be 5% abv or slightly higher, and the colour will tend to be a deep amber, but the defining characteristic is the cask conditioning. Kellerbier is German for "cellar beer". Zwickelbier was originally a sample amount of beer taken by a brewery boss from the barrel with a help of a special pipe called a "Zwickelhahn". Zwickelbiers are unfiltered lagers like Kellerbier, though with a slightly different conditioning process which gives the lager more carbonation. Zwickelbiers tend to be younger, lower in alcohol and less hoppy than Kellerbiers. 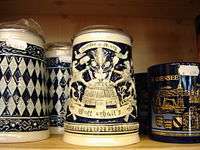 A very similar beer is Zoiglbier, which in the Upper Palatinate's brewing practice is advertised with a "Zoiglstern" (i.e., sign) — a six-pointed blue-and-white symbol made from wooden slats, similar to a Star of David. While the beer market is weaker but more centralized in northern Germany, the south has lots of smaller local breweries. Almost half of all German breweries are in Bavaria. In total, there are approximately 1,300 breweries in Germany producing over 5,000 brands of beer. The highest density of breweries in the world is found in Aufseß near the city of Bamberg, in the Franconia region of Bavaria with four breweries and only 1,352 citizens. The Benedictine abbey Weihenstephan brewery (established in 725) is reputedly the oldest existing brewery in the world (brewing since 1040). In 2004, Oettinger replaced Krombacher as the best selling brand in Germany. The alcohol-by-volume, or ABV, content of beers in Germany is usually between 4.7% and 5.4% for most traditional brews. 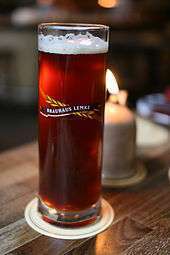 Bockbier or Doppelbock (double Bockbier) can have an alcohol content of up to 16%, making it stronger than many wines. 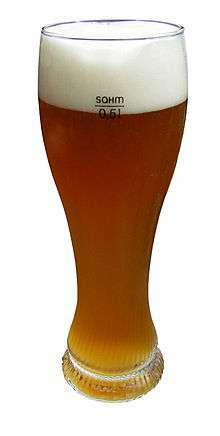 A Weizen glass is used to serve Weizenbier. Originating in Germany, the glass is narrow at the bottom and slightly wider at the top; the width both releasing aroma, and providing room for the often thick, fluffy heads produced by wheat beer. It tends to be taller than a pint glass, and generally holds 500 millilitres with room for foam or "head". In some countries, such as Belgium, the glass may be 250 ml or 330 ml. Wheat beers tend to foam a lot, especially if poured incorrectly. In pubs, if the bottle is handed to the patron for self pouring, it is customary for the glass to be taken to the patron wet or with a bit of water in the bottom to be swirled around to wet the entire glass to keep the beer from foaming excessively. 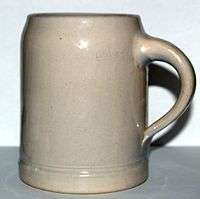 A beer stein (or simply a stein /ˈstaɪn/) is an English neologism for a traditional type of beer mug. Steins may be made of stoneware (rarely the inferior earthenware), pewter, porcelain, silver, glass, or wood. They may have open tops or may have hinged pewter lids with a thumb-lever. 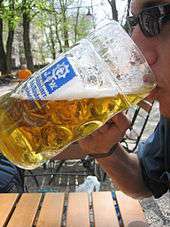 Steins usually come in sizes of a half litre or full litre (or comparable historical sizes). Like decorative tankards, they are often decorated in nostalgic themes, generally showing allusions to Germany or Bavaria. It is believed by some that the lid was implemented during the time of the Black Plague to prevent diseased flies from getting into the beer. The Maß (pronounced [mas]) is a term used in German-speaking countries for a unit of volume, now typically used only for measuring beer sold for immediate on-site consumption. In modern times, a Maß is defined as exactly 1 litre. As a maß is a unit of measure, various designs are possible: modern maß krugs are often handled glass tankards, although they may also be in the form of steins. At the Octoberfest beer is only available in maß krugs. A Stange (stick or rod) is a cylindrical glass that is traditionally used for Kölsch beer. A Becher (tumbler), traditionally used for Altbier, is similar to a Stange but is slightly shorter and much thicker. Stangen are carried by placing them into holes in a special tray called a Kranz (wreath). In Cologne Stanges are usually served by traditional waiters called Köbes. Beer boots (Bierstiefel in German) have over a century of history and culture behind them. It is commonly believed that a general somewhere promised his troops to drink beer from his boot if they were successful in battle. When the troops prevailed, the general had a glassmaker fashion a boot from glass to fulfill his promise without tasting his own feet and to avoid spoiling the beer in his leather boot. Since then, soldiers have enjoyed toasting to their victories with a beer boot. At gatherings in Germany, Austria, and Switzerland, beer boots are often passed among the guests for a festive drinking challenge. Since the movie Beerfest appeared in 2006, beer boots have become increasingly popular in the United States. 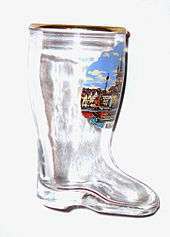 Glass beer boots are either manufactured using a mold or from mouth-blown glass by skilled artisans. In Germany, beer boots usually contain between 2 and 4 litres and are passed from one guest at the table to the next one clockwise. When almost reaching the bottom of the boot, it suddenly starts bubbling. The drinker who caused the bubbling has to order the next boot. There are also boots known with 6 and 8 litres. Oktoberfest is a 16- to 18-day festival held annually in Munich, Bavaria, Germany, running from late September to the first weekend in October. Only beer which is brewed within the city limits of Munich with a minimum of 13.5% Stammwürze (approximately 6% alcohol by volume) is allowed to be served in this festival. Upon passing this criterion, a beer is designated Oktoberfest Beer. Large quantities of German beer are consumed, with almost 7 million liters served during the 16-day festival in 2007. Recently in 2015 the festival officially served 7.3 million liters of beer. The Cannstatter Volksfest in Stuttgart. In many cases, the beer festival is part of a general funfair or volksfest. ↑ "Vorläufiges Biergesetz". Archived from the original on 9 September 2007. Retrieved 2007-09-04. ↑ "492 Years of Good Beer". Archived from the original on 11 May 2011. Retrieved 2011-05-26. ↑ "Kirin Beer University Report, Global Beer Consumption by Country in 2012". Table 3. ↑ "Bavaria"; Bolt, Rodney; Globe Pequot Press; Connecticut; 2005; pg 37. ↑ Archived March 20, 2005, at the Wayback Machine. ↑ "492 Years of Good Beer: Germans Toast the Anniversary of Their Beer Purity Law - International - SPIEGEL ONLINE - News". Web.archive.org. Archived from the original on October 24, 2008. Retrieved 2016-01-30. ↑ "Weissbier". German Beer Institute. Archived from the original on 24 October 2010. Retrieved 2010-10-07. ↑ M. Gibson (2010). The Sommelier Prep Course: An Introduction to the Wines, Beers, and Spirits. John Wiley and Sons. p. 364. ISBN 9780470283189. Retrieved 2010-10-07. ↑ Archived April 24, 2014, at the Wayback Machine. ↑ "Michael Jackson's Beer Hunter - Beer Styles: Kellerbier". Beer Hunter. Archived from the original on 5 July 2008. Retrieved 2008-06-30. ↑ Ben McFarland, World's Best Beers: One Thousand Craft Brews from Cask to Glass, page 27. Sterling Publishing Company, Inc., 2009, ISBN 1-4027-6694-7. 2009-10-06. ISBN 9781402766947. Retrieved 2010-03-10. ↑ The Beer Journal. Google Books. 2007-08-30. ISBN 9781430312468. Retrieved 2010-03-10. ↑ Gary Kirsner (1999). "A Brief History of Beer Steins". Archived from the original on 3 June 2009. Retrieved June 19, 2009. 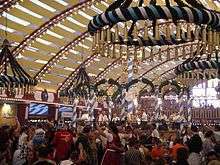 ↑ "History of Oktoberfest - How It Began in Munich Germany". Retrieved 2016-07-07. 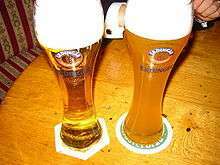 Wikimedia Commons has media related to German beers.